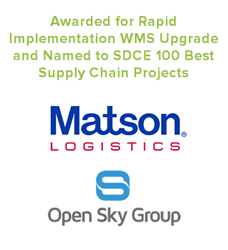 Open Sky Group and Matson Logistics announce today their inclusion in the Supply & Demand Chain Executive (SDCE) 100 Best Supply Chain Projects 2018. Open Sky Group, a global specialist for implementing JDA Software solutions, has worked with Matson Logistics, a leading third-party logistics service provider, for over a decade on supply chain software improvement projects. Most recently the two companies worked together to upgrade Matson’s JDA Warehouse Management software at its 1.1-million-square-foot logistics campus in Savannah, GA. While technology was the main driver, another compelling aspect for Matson was Open Sky Group’s rapid implementation approach. The project won the recognition because of the way the two companies worked together to redefine processes for Matson, taking advantage of the functionality in the newest versions and for the tremendous cost-savings achieved. With over 27,000 SKUs and sub-SKUs, the Matson distribution center serves international and domestic retailers with services including e-commerce and retail order processing. The JDA Warehouse Management software upgrade was seamless to Matson’s customers and the new WMS was managing the operation’s full volume within 24 hours of go-live. “Open Sky Group helps us achieve our focus of driving efficiencies in - and costs out - of supply chain networks for our clients. Through this most recent JDA Warehouse Management software upgrade with Open Sky Group, we’ve achieved significant cost savings in both IT systems and operations, including savings of roughly 30% in maintenance costs. Plus, its approach removes much of the risk and stress out of future upgrades, both for us and our customers, because we no longer have a large number of modifications to work around each upgrade,” says Dan Wadley, VP of Warehousing and Risk Management for Matson Logistics. The SDCE 100 is an annual list of 100 great supply chain projects. These projects show how supply chain solution and service providers help their customers and clients achieve supply chain excellence and prepare their supply chains for success. "We've worked with Matson Logistics for over ten years on supply chain software projects of varying sizes and complexity. Most recently, we used our unique, disciplined agility upgrade approach to enable a rapid implementation so that Matson could achieve a faster return on its software investment. We're proud of what we've been able to help them accomplish and are honored to have that work selected for SDCE 100 Best Supply Chain Projects," says Darcy Reeves, VP, Marketing for Open Sky Group. A subsidiary of Matson, Inc., Matson Logistics offers customers complete North American freight transportation services with any size, any distance truck haulage and intermodal carriage using all Class I rail networks. The company’s East and West Coast warehouses provide inventory receiving, storage, and distribution, including preparing merchandise to retail-ready requirements and for DtC fulfillment. Its Supply Chain services help importers manage the intricacies of sourcing overseas, from factory orders to final delivery. By combining 3PL services and multimodal transportation with process expertise and digital transformation technology, Matson Logistics speeds customers’ products to market and optimizes their overall value chain. Open Sky Group is a global specialist offering services for WMS, Labor and TMS software upgrades and implementations. A gold implementation partner and reseller of JDA Software for Warehouse Management (WMS), Warehouse Labor Management (WLM) and Transportation Management (TMS) software, Open Sky Group strives every day to be the best consulting partner on the planet for supply chain solutions.